Against the backdrop of the Second World War, what is now known as the CDGA Foundation was founded in December 1944. 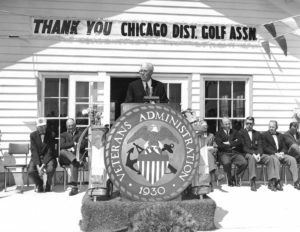 As the events of WWII continued in Europe and the Pacific, Chicago District Golf Charities, Inc. was formalized to continue the charitable work the CDGA had done for veterans, as well as wounded soldiers and sailors, since the early 1920s and those affected by the First World War. Immediately the charity went to work, raising money for wartime efforts of the American Red Cross, United Service Organizations (USO) and others to support our nation’s returning heroes. In its first year, the Charities raised more than $15,000 utilizing a “dime-a-round” fund at member clubs, with the funds going to the Red Cross. Over the course of the war, the CDGA and CDGC raised more than $123,000 (approximately $2 million in 2014 dollars) in support of our nation’s servicemen. The Charities’ efforts continued after the conclusion of the war with the Chicago Victory Open, held through 1948. The Open was converted in 1949 to a four-man exhibition, then disbanded in 1950, as the cost of players and printing began eating away at the funds for veterans’ rehabilitation. However, “Veterans Days,” which saw club professionals standing at the tee to take donations from members over one weekend each summer, continued to support the USO and several golf facilities at VA hospitals. 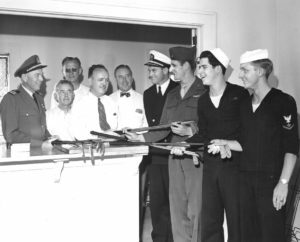 Veterans Days continued until 1955, when the Charities asked each CDGA member to donate $1 to help support using the game to assist wounded veterans. This donation drive was continued into the 1960s, when the CDGC began a travel program, giving CDGA members discounted travel on trips around the world. The trips benefitted the Charities and its mission, with thousands of members travelling to destinations such as Puerto Rico, Rome, Scotland, Paris and the French Riviera during the program’s heyday. One of those trips was to the 1973 Ryder Cup, where the likes of Billy Casper, Lee Trevino, Jack Nicklaus and Arnold Palmer brought the Cup back to the U.S. with a dominant day of singles play. 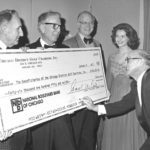 In the 1970s, the Foundation began to broaden its charitable giving, reaching programs like the Chicago Boys Club, St. Vincent Infant Home, Children’s Memorial Hospital and Salvation Army, all while still supporting golf and golfing facilities at the area’s VA hospitals. At one point, funds were being donated to more than 40 community-based charities in addition to the veterans initiatives. In 1978, the decision was made to return to serving golf-based initiatives in Illinois and the Chicago District and a year later the name of the Charities was changed to the Chicago District Golf Foundation. 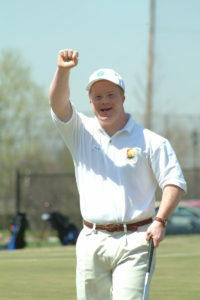 In the early 1990s, the Foundation underwent another name change and adjustment of the mission, becoming the CDGA Foundation focusing on bringing “the benefits, attributes and resources of the game of golf to people in need throughout the area.” In 1993, the CDGA Foundation Club (a predecessor to the Sunshine Club) was created, with 18 clubs being a part of the inaugural group. Through the 1990s, nearly $1 million was distributed to groups like the Illinois Junior Golf Association, Marianjoy Rehabilitation Center, Hook-a-Kid-on-Golf Foundation and the National Amputee Golf Association. In 1999, the “Sunshine Through Golf” camp program was introduced in conjunction with Cog Hill Golf & Country Club and the SRA of Lemont. The initial five-week camp brought the game to individuals with physical and mental disabilities with the aim of becoming a training tool for participants to learn the game and participate in the Special Olympics. Since that change in 2004, the Foundation’s camp program and event calendar have expanded greatly. In the early 2000s, the camp program consisted of just 10 camps helping less than 100 golfers. Through partnerships with local Special Recreation Associations (SRAs), golf facilities and professionals, this year the Sunshine Through Golf Camp Program will reach more than 1,200 golfers at nearly 100 camps. In 2009, the Sunshine Through Golf Foundation Golf Marathon was introduced, with 20 golfers collecting pledges and playing 100 holes of golf at the Zigfield Troy Golf Course in Woodridge. In an effort to increase the recognition of its ties to the CDGA, the Foundation rebranded and officially became the CDGA Foundation once again in 2016. As part of a long range planning initiative designed to maximize the Foundation’s ability to thrive for the foreseeable future, the Foundation Board determined that a closer identification to the CDGA was desirable. Coinciding with the name change was an increase in the diversity of programming offered by the Foundation. In addition to continuing its Sunshine Through Golf Camp Program, the Foundation expanded its veterans programs by seeking opportunities to work with groups such as RevelationGolf and the Odyssey Golf Foundation. The Foundation’s new realm of impact will be with youth golfers, particularly those economically disadvantaged. Through a new partnership with Youth on Course, a non-profit started by the Northern California Golf Association, the Foundation began to provide youth the opportunity to play at various local golf courses for $5 or less.